Do you think you know Israeli music? Get ready to shake up your ideas with the Balkan Beat Box Soundsystem. On May 24, the dynamic trio will be playing at the Platinum: Celebrating Israel at 70 concert at the Royal Albert Hall, the event put on by the Jewish Leadership Council and the UJIA to mark the Jewish state’s birthday. 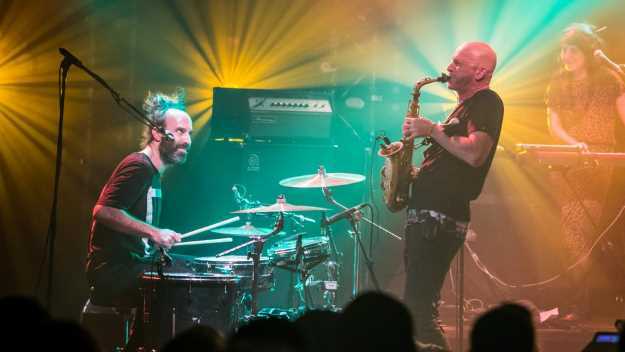 Balkan Beat Box Soundsystem (BBB as they are fondly known) include saxophone player Ori Kaplan, drummer/ programmer/ producer Tamir Muskat and charismatic vocalist/ MC Tomer Yosef. At the concert they will be joined by special guest singers Ethiopian Israeli Gili Yalo, Shai Tsabari and Yemenite all-star female group A-WA. Kaplan lived in New York for 16 years, where he met Muscat, and BBB was conceived. Their music has been described as “gypsy rock”, Kaplan likes “ambassadors of groove’” The eclectic musical melange takes you travelling — one moment your feet are in the sand dancing on the beach in Jamaica, then you are touching palms with your neighbour, circling to a traditional Greek Zorba on a sun-kissed Mediterranean island, followed by time travel to the shtetl and the familiar plaintive keys of klezmer. Seventy years after Israel’s conception, this is a far cry from the traditional melodies of the Zionist pioneers, or tear-jerking tunes that dream of Jerusalem the Golden. It’s not all party, however, as the politically charged tracks Ramallah-Tel-Aviv and War Again prove. “We are abut communicating the cultural connections that exist here,” explains Kaplan. “As Israeli musicians, we have the ability to express all those influences. Yet, once living in NY we had to find our own identity, and we discovered a melting pot of people looking theirs. We were urban, immigrant, club, mash-up. “As we travelled for gigs, we found a similar phenomenon in other cities — Paris, Washington, Berlin. There is a new immigrant energy that’s the urban scene in so many cities right now, and Israel is the microcosmic melting pot of the cultures that you find on a wider scale in New York.